After the success of the peanut butter magnums I thought this was worth a go. The name sounds like a Yorkshire man asking his wife if she wants this flavour (peanut butter, love?) 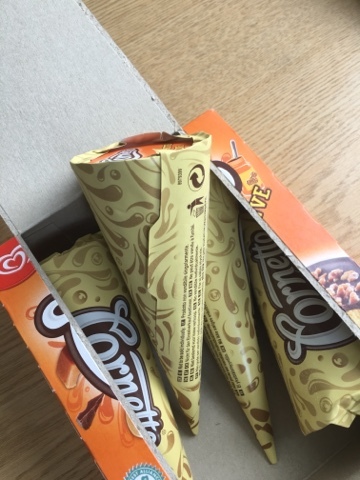 but it's the standard Walls Cornetto brand so you know roughly what to expect. It's a multipack so the cones feel tiny. Yet they look decent enough in the hand, and have stayed together pretty well. On top we have a lovely chunk of the same chocolate they use for the centre of the Feast bar, with similar nuts on top. The Icecream tastes nutty too, with maybe a hint of coffee, but is soft and lovely as you'd expect. Inside this is a spike of presumably peanutty goo, but with the other flavours going on this just tasted sweet. 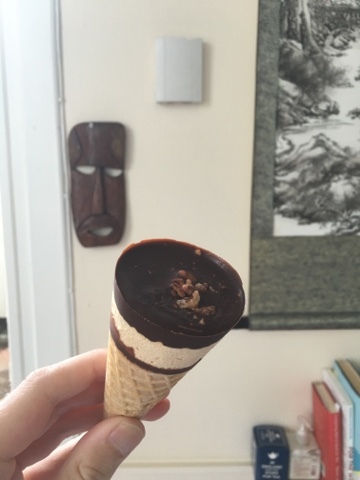 Naturally the bottom is full of chocolate too which means the cone doesn't go squishy. 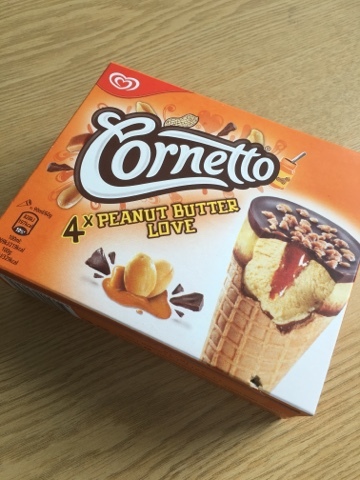 As we've discussed before, the fall of the Cornetto from the premier icecream brand to mid-table obscurity is probably due to people wanting more choc and less ice, but with varieties like this which is a lot closer to a Ben and Jerries style mix of experiences they could be in for a good summer. Especially if you can buy larger ones while out and about.